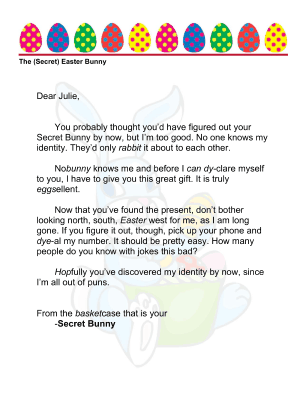 This printable letter is from a Secret Bunny, much like a Secret Santa, and can be used in Easter office gift exchanges. 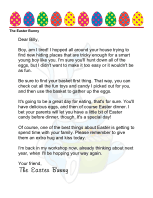 It is full of rabbit and candy puns and hints at the giver's identity. You probably thought you'd have figured out your Secret Bunny by now, but I'm too good. No one knows my identity. They'd only rabbit it about to each other. 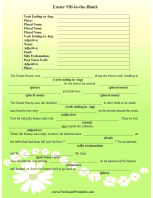 Nobunny knows me and before I can dy-clare myself to you, I have to give you this great gift. It is truly eggsellent. Now that you've found the present, don't bother looking north, south, Easter west for me, as I am long gone. If you figure it out, though, pick up your phone and dye-al my number. It should be pretty easy. How many people do you know with jokes this bad? Hopfully you've discovered my identity by now, since I'm all out of puns.